The No Parallax Point (NPP), sometimes called the Entrance Pupil, Nodal Point or Front Nodal Point, is the “point” where a ray entering the lens meets the principal ray (axis) of the lens. For most lenses, especially Fisheye lenses, this is not a single point and its location along the principal ray depends on the angle of entry into the lens as shown in the example using a Samyang 8 mm lens. More examples can be found by scrolling down in “Finding the Nodal Point of a Lens”. Knowledge of the the NPP is important when using photographs for measurement with non-metric lenses as covered in “Photographic Intersection“ and for making panoramas, especially 360° or Spherical panoramas. When creating panoramas rotating the camera about the NPP provides the best solution as explained in “Create Panoramas”, but as also covered there it is a matter of scale and really of no interest if the subject matter is not close to the camera or creating “Letterbox” panoramas. However, when creating 360° panoramas rotating the camera about the NPP will improve the stitching of the images. When creating 360° panoramas in confined spaces, such as the inside of a car or aeroplane cockpit, rotating the camera as accurately as possible about the NPP is crucial, but if the closest point of the subject is more than a couple of meters away then a few millimetre of error is not going to have any significant impact, which is just as well as how do we decided what point to select as our NPP as it varies with the angles of the incoming rays. The suggested choice is to select the ray entering at the “join” of the images so we would select the point for the ray entering at 45° to the principal ray for four shots round, but for six shots round we would select the point for the ray at 30° to the principal ray as shown in the following images. Note that the NPP is completely ignored for the handheld nadir shot when using a technique such as PTGui’s “Viewpoint Correction”. To rotate the camera around the NPP there is a considerable choice of panoramic heads. If your equipment requires multi-row images then heads such as the Nodal Ninja NN3 and NN6 are ideal as these are designed to rotate the camera about the lens NPP in both the vertical and horizontal axes. For single row panoramas, such as with an FX body and 8mm fisheye lens it is important to remember that heads such as the Nodal Ninja R1 and R10 rote the camera about the vertical axis, but that the horizontal axis of rotation is some distance below the NPP so if the camera rotated about the horizontal axis the lens needs to be moved backwards or forwards to bring the NPP back into line with the vertical axis of rotation. 45e.g. 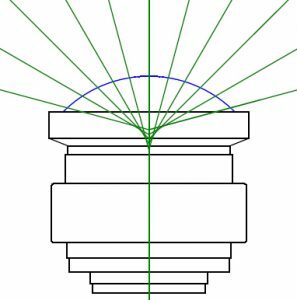 For a Samyang 8mm R1 the vertical rotation point is some 72mm below the principal ray so tilting the lens by 7.5° moves the NPP by some 9.5mm, so the difference on the scale between the lens at -7.5° and +7.5° is some 19mm.